Asthma is a respiratory condition in which your airways narrow and swell and produce extra mucus, making it difficult to breath and resulting in coughing, wheezing, and shortness of breath. It is the most common chronic disease of childhood, affecting more than six million children in the United States alone. Asthma can be a minor inconvenience for some people, but for others it can be a serious – even life-threatening – problem that hinders one’s quality of life. Other asthma triggers include air pollutants and irritants (e.g. smoke), certain medications, stress, sulfites and preservatives in various types of food and beverages (shrimp, dried fruit, wine, and beer), and gastroesophageal (acid) reflux. In children, establishing a diagnosis of asthma involves comprehensive history taking, physical examination, and oftentimes diagnostic studies. Other potential causes of symptoms must be carefully considered, particularly in young children, when lung function testing is technically difficult. Although asthma can’t be cured, it can usually be managed with rescue inhalers like albuterol (which treats symptoms) and controller inhalers like steroids (which prevent symptoms). 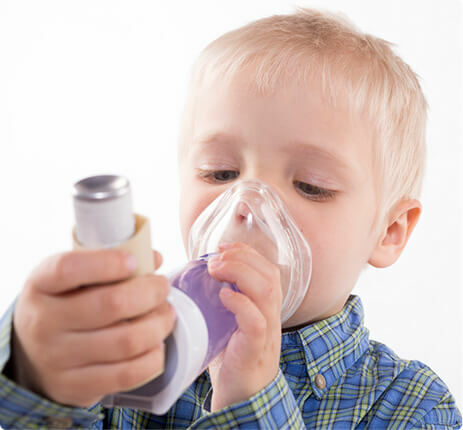 A severe case of asthma may require a longer-acting inhaler – such as formoterol, salmeterol, or tiotropium – along with oral steroids to help keep your child’s airways open and normalize his or her breathing. At Chicago Pulmonary Specialists, we provide comprehensive diagnostic testing and effective treatment for asthma for those suffering from asthma. For more information, call us today at (847) 998-3434 or request an appointment using our convenient online form. Get our free monthly newsletter from Chicago Pulmonary Specialists with access to news, health tips, and more! At Chicago Pulmonary Specialists, Dr. Boas and his staff provide comprehensive pulmonary function testing, asthma testing, and sports and exercise testing to help enable all children and adolescents to live life to the fullest without limitations imposed by an underlying respiratory-related condition.